Miki: Sho, you have to hit the ball into the court! This isn't baseball. Yota: come on, Sho! You can do it! Miki: You're the referee, Yota! Don't take sides. Sho, what are you doing? Sho: I'm trying to find the ball. Where is it? 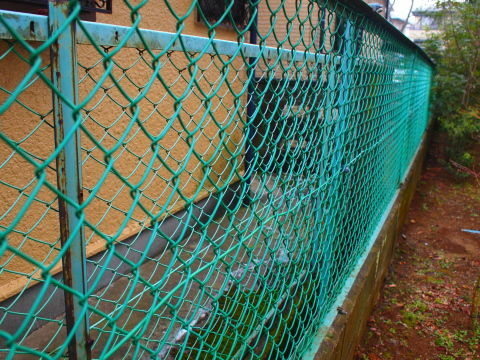 Miki: It's way behind you, by the chain-link fence. Yota: Miki, this isn't fair for Sho. Can he win the match if he wins one game? Sho: No, Yota! Miki and I will play by the same rules. Q: Why is Miki angry at Yota? A: Because Yota is taking sides. It's way behind you, by the chain-link fence. ◆: Where is Kate? - She's way behind you. ◆: Where is Pochi? - He's just in front of you, under the table. Where is Pochi? - He's just in front of you, under the table. （解答) Where are my glasses? - They're on the table, under the magazine. It's on the tree, between the branches.